Pugs are one of the most popular dog breeds with easily recognizable wrinkled face and robustly built body. This is the largest of toy breeds, with an average weight from 14-18 pounds, but it isn’t uncommon for a Pug to weigh more than 20 pounds. Pugs are famous for their healthy appetites and they tend to eat more than they need which can lead to obesity and other health problems. Like most pedigree breeds, Pugs are prone to some health problems which can be avoided with proper nutrition and the best dog food for Pugs. To help you find the right food for your pooch we will list 5 dog food options that meet the nutritional needs of Pugs. How to find the best dog food for Pugs? All dogs have the same basic nutritional needs, but every breed has its unique dietary requirements and this applies to Pug diets as well. You should consider your dog’s age, activity level, and any health problems when you are shopping for his food. What are the calorie requirements of Pugs? Life stage and activity level determine how much calories a dog needs per day. The best dog food for Pug puppies needs to have enough calories to sustain a growing pup. If your adult Pug seems to lose weight you should increase his calorie intake and give him more of the best dog food for Pugs. But if he starts to put on the pounds you should cut back on calories. – Puppies: Generally, a Pug puppy will need 50 calories per pound of body weight. However, this amount can vary up or down by 30% based on the activity levels, individual metabolism, and health. – Adult: Grown Pug needs on average 40 calories per pound of body weight, and again this amount can vary by 30%. More active intact adult dogs will need more calories compared to spayed/neutered pooches that spend their days napping. – Senior: As a dog ages he is less active and his metabolism slows down thus he needs fewer calories. Older Pugs need 30 calories per pound of body weight, however, this amount can vary based on the individual needs of your dog. What to look for in food for Pugs? To keep your dog healthy and happy you need to feed him with high-quality and nutritious best food for Pugs. We recommend that you stay away from foods that contain fillers, additives, preservatives, or animal by-products. – Quality protein: Look for Pug food that has a named meat protein or named meat meal as the main ingredient. Meat is the source of energy and amino acids that build muscles, tissues, and organs. – Moderate fat content: According to AAFCO the minimal fat content for adult dogs is 5% and 8% for puppies. Pugs are a small breed that needs more calories, however, they are prone to obesity so look for foods with around 13% fat. – Easily digestible carbs: Generally, Pug diet needs to be low in carbs since they can develop weight issues. Look for easily digestible grains like brown rice and oatmeal, or vegetables like sweet potatoes. – Supplements: Dog food is made under very high temperatures, so most vitamins and minerals get lost in the process. Most food brands add supplements and you should look for foods that have added chondroitin, glucosamine, prebiotics, and probiotics. Does this breed have special dietary considerations? Pugs have a fairly unique appearance that comes with a price and this breed is predisposed to several health problems. So what do Pugs eat to maintain their health in perfect order? – Joint support: It may come as a surprise but Pugs are ranked as the second most likely breed to develop hip dysplasia. To minimize the chance of this condition it is important to keep your dog at a healthy weight and feed him with Pugs food that supports joint health. – Kibble size: Pug eating larger kibble food may experience chewing problems since this breed has thick lips and flat face. It is best to buy small breed kibble to make eating easier and enjoyable for your pup. – Weight issues: This breed loves eating and an average Pug eats more than he needs and it’s at higher risk of weight gain. Instead of free feeding your dog set up meal times and try not to cave when your pooch starts pleading for more food. – Allergies: Some Pugs can develop food-related skin allergies, and in that case, you will have to make certain dietary changes. It is best to choose a limited ingredient Pug dog food until you find out what ingredient is causing his allergy symptoms. Developing puppies and adult dogs don’t need the same amounts of food, and their mealtimes differ. – Puppy: Pug puppy food needs to be served in 3 meals equally spaced through the day. This will supply the puppy with enough nutrients for a healthy growth and development. – Adult: Grown Pugs can have only one or two meals per day. But the most important thing is that you don’t feed your dog in between meals or allow him to free feed and eat during the whole day. Now that you know a little bit more about the eating habits and needs of this breed we will proceed with the review part of our article. Be advised that there isn’t one single diet that works for all Pugs so consult with your vet prior to making any dietary changes. Wellness is one of the leading dog food brands with a variety of different formulas that cater to the needs of every dog. 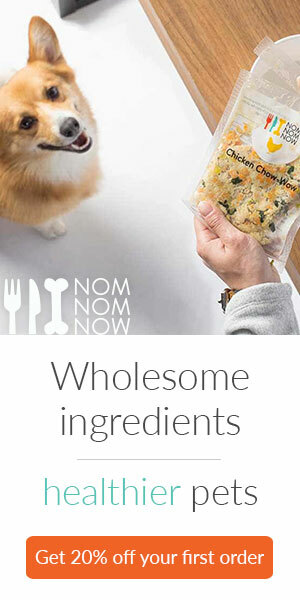 Their Core line is made with only premium quality ingredients and zero grains for dogs with grain allergies. The main ingredient Deboned Turkey is followed by Turkey and Chicken meal which are excellent sources of protein. Combined they make not less than 36% crude protein which supports muscles, tissues, and organs. Chicken Fat, Flaxseed, and Salmon oil are main sources of fat and key energy providers. Combined they create a minimum of 15% crude fat which is the perfect amount for a small breed like Pugs. Healthy sources of carbs are Potatoes and Peas that are easy to digest and at the same time won’t cause an allergic reaction. 5% of crude fiber will keep your dog’s belly full and at the same time regulate his bowel movements. CORE for small breeds also contains fresh vegetables and fruits that are reinforced with added supplements for optimal health. Omega 3 and 6 fatty acids support healthy skin and coat, and glucosamine and chondroitin are added for mobility and joint health. This brand makes dog food so it mimics the ancestral diet of dogs and contains novel protein sources and no grains. This is our choice for best puppy food for Pugs since it is made of high-quality ingredients and supports digestive health. The main ingredient is Buffalo, followed by Lamb meal as premium novel sources of protein. Combined they create a minimum of 28% crude protein which supports growth and the development of Pug puppies. Salmon oil is a source of fat and DHA which supports brain development. It creates a minimum of 17% crude fat and serves as the main source of energy and at the same time supports healthy skin and coat. Sweet potatoes are easily digestible carbs and the reason why your puppy’s stomach will stay full for a longer period of time. Fruits and vegetables like tomatoes and blueberries are full of antioxidants and support a strong immune system. Dried Chicory root is added for its prebiotic properties and will ensure that your puppy doesn’t experience any digestive problems. All the necessary vitamins and minerals are added and make this food complete and balanced and a suitable choice for Pug puppies. Blue Buffalo made this food specially for adult small breed dogs using the best ingredients. If you prefer feeding your Pug with canned dog food consider trying this formula. The main ingredient is Chicken which makes a minimum of 10% crude protein which is 45.45% on dry matter basis. Flaxseed and Salmon oil are sources of fat that create 7.5% crude fat and at the same time support healthy skin and coat. Carrots, Peas, and Brown Rice are easy to digest and create 1.5% crude fiber. Blue Buffalo also included L-Carnitine and Glucosamine that support toned muscles and joint health. Added vitamins and minerals make this canned dog food complete and balanced and suitable for daily feeding. Nature Balance Limited Ingredient Diet is made for dogs with allergies and sensitive stomach. The limited number of premium quality ingredients will relieve your pup’s symptoms and provide all the necessary nutrients. The main ingredient is easily digestible Sweet Potato that won’t provoke allergies and will keep your dog’s stomach full. Salmon is the main protein source that creates 21% of crude protein which is the right amount for Pugs. Canola oil is the main source of fat which creates 10% of crude fat and provides enough energy for small breeds. All necessary vitamins and minerals are added to support the overall health of a dog and make this food complete and balanced for everyday use. Pugs are intelligent and charming breed with a unique appearance and dietary needs. As all pure breed dogs, Pugs have some health problems and need to eat the best dog food for Pugs to stay healthy. Pugs diet needs to have higher protein levels, moderate fats, fewer carbs and to contain only high-quality and nutritious ingredients. Consider the age, health problems, and the activity level of your Pug in order to find the right food for him, and when in doubt talk with your vet.